Certainly, BU will miss head coach Patrick Chambers next season! Patrick Chambers’ tenure as men’s basketball coach at Boston University lasted two years. On Friday he bolted from the Terriers for the greener pastures of the Big Ten, where he’ll take the helm at Penn State. Look, this is nothing new in college basketball. A job opens up at a so-called “powerhouse” conference. The spotlight shines on a young coach who’s having success at a lesser-known program. That coach takes the new job. It happens all the time, every off-season. Chambers used to be an assistant in Villanova. He’s from Philadelphia originally. He’s now returning home to Pennsylvania. All of this makes a lot of sense. But as a BU alum, I will miss coach Chambers. He brought a style of play that was fun to watch – much, much more exciting than his predecessor, Dennis Wolff. Don’t get me wrong; Wolff won a lot of games during his tenure on Commonwealth Ave, even leading BU to the tournament a couple of times. But as a fan who‘s been to more than his share of games at Agganis Arena and The Roof, it could at times be quite boring to watch the Terriers on the court. With Chambers at the helm, the team played a much more exciting brand of basketball. The Terriers were a hustling, scrapping bunch. The results showed. Chambers was [42-28] in his two seasons with the Terriers. In February and March, he was [21-4]. Oh, and there was that victory over Stony Brook in March to send BU to the Big Dance for the first time in nine years. 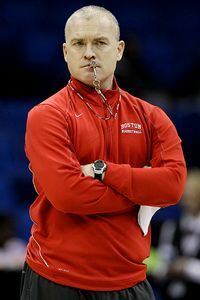 BU associate Brian Daly has been named interim coach while the school searches for a new headman. I can only hope my alma mater does the right thing and gets another Chambers wannabe. This is a program that struggles to draw 1,000 fans to a game, aside from the America East title game which drew nearly 4,000. Chambers had laid the foundation for a long period of excellence on the court. It’s now up to the university to step up and keep it going. This is the second big coaching change in the America East this offseason. Two weeks ago, John Becker was named head coach at Vermont. He replaced Mike Lonergan, who left for George Washington. Good luck, coach Chambers. PSU is getting a good one. The Spartans, Badgers and Buckeyes are waiting for you.